Dyson makes two types of tower fans, those that are used only for cooling (Cool Only Type) and those that can be used year round for both cooling and heating (Hot+Cool Type). Both type of fans make use of the Dyson Air Multiplier Technology to amplify surrounding air to produce powerful airflow. No blades are used. All you feel is an uninterrupted stream of smooth air that is either cool or hot depending on whether the fan is used for cooling or heating, and the airflow velocity can be precisely adjusted. When Dyson Hot+Cool type fans are used in heating mode, two ceramic plates heat the air as it is projected into the room. These plates don't burn dust and therefore do not produce any bothersome and worrying burning smell. In addition, these heating fans are equipped with an intelligent thermostat that allows setting the temperature to the degree and maintains the room at the desired temperature without wasting any energy. When Dyson fans are used in cooling mode, though they are not A/C units, they do an excellent job moving air to make the room feel cooler. Other fan heaters claim also to be cooling fans as well, but many have low airflow and air velocity, so in reality they are not! The Dyson Hot+Cool fans draw in up to 7 gallons of air per second, generating high airflow and air velocity, for improved personal cooling. They are energy efficient: With smoother airflow through the machine, less energy is required to channel the air. The energy efficient motor can run slower while enabling the same powerful airflow. The sleep-timer further reduces energy wastage by ensuring the fan switches off automatically when it’s not needed. They are very safe and a breeze to clean: The machine cuts out automatically if it's tipped over and there are no visible heating elements or blades. With no fast-spinning blades and no awkward grilles, Dyson fans are also very easy to clean. They can be cleaned with a single wipe of a cloth. At low and medium speeds, they are reasonably quiet : They use streamlined air channels for reduced airflow turbulence making them quieter than most other type of fans. They also have an acoustically engineered motor bucket to reduce vibration and therefore noise. This article will compare Dyson AM05, Dyson AM06, Dyson AM07 and Dyson AM09 bladeless tower fans. Note that AM06 and AM07 are strictly cooling fans, while AM05 and AM09 are both cooling fans and heaters, and that at the time this article was written these tower fans had received excellent reviews from most Amazon buyers (an average of at least 4 stars each out of 5 stars!). Note also that, at the end of this article, we will also present the Dyson Pure Hot+Cool Link Air Purifier that also purifies the air while cooling it or heating it. Dyson Bladeless Tower Fans on Amazon. The following pictures show the four Dyson Air Multiplier fans to be compared below. As mentioned above, AM06 and AM07 are strictly cooling fans, while AM05 and AM09 are cooling fans but also heaters. When you click these images, you will be given a choice of additional colors. Air Multiplier technology is used to amplify surrounding air to enable long-range heat projection and to produce powerful airflow. No blades are used. All you feel is an uninterrupted stream of smooth air that is either cool or hot depending on whether the fan is used for cooling or heating. All four fans come with a remote-control unit that allows the invocation of all the functions built in these fans. Note that as explained below, except for the AM05, most of these functions are only available from the remote-control unit. Of the four Dyson fans considered here, AM05 is the only one that provides control buttons both on the fan and the remote-control device for all the available functions. There are 10 levels of air flow (or speed) that can be invoked. With AM09, this function can only be accessible from the remote-control device. AM05, AM06 and AM07 allow invocation of this function both from the remote-control device and from the fan itself. Being also heater fans, AM05 and AM09 allow exact temperature setting from 33° F to 99° F. They use an intelligent thermostat to maintain the selected temperature. Once your room is at the set temperature, the heater will switch itself off. It will then switch on and off intermittently to keep the room at your target temperature. This helps to save energy and prevents the room from overheating. With AM05 temperature setting can be done from the remote-control device or from the fan itself. With AM09 the remote control must be used. With both AM05 and AM09, in heater mode, two ceramic plates heat the air as it is projected into the room. These plates don't burn dust and therefore do not produce any worrying burning smell. Note that with AM06 and AM07 cooling fans and when AM05 and AM09 are used in cooling mode, all four fans do an excellent job moving air to make the room feel cooler. In focused mode, warm air is accelerated through a 2.5mm aperture and over an airfoil shaped ramp. It is redirected by the focus ramp, which projects a powerful stream of warm air towards you. In diffused mode, a powerful jet of air is released from the back aperture. As the two jets meet, air is guided over a ramp at a 45-degree angle, releasing a wide stream of powerful airflow. Note that Jet Focus technology is only available on AM09 and it can only be invoked from the remote-control device. Oscillation control allows the airflow to be directed around the room. With AM06, AM07, and AM09, this function is only accessible using the remote-control device. AM05 is the only one that allows invocation of this function from the fan itself. Each of these four fans can be tilted to direct airflow. The fan can pivot on its own center of gravity, staying put without clamping. Note also that for safety reasons the motor in these fans cuts out automatically if the fan is tipped over. And since there are no fast-spinning blades or visible heating elements these fans are extremely safe. AM06, AM07 and AM09 fans can be programmed to turn off after pre-set intervals ranging from 15 minutes to 9 hours. This function is not available on AM05. Note that the sleep timer of AM06, AM07 and AM09 can only be accessed using the remote-control device. So which Dyson Air Multiplier Fan is best for you? All four fans considered above come with the features summarized in the introduction. They all use the Dyson Air Multiplier technology, offer high-end looks, and are very functional and very easy to operate. They are also energy efficient, easy to clean, and safe. ​If what you need is just a cooling desk fan or cooling floor fan, you might want to consider either AM06 (desk fan) or AM07 (floor fan). Note that both fans come with the same feature set described in the feature comparison table above. All functions except for power on/off are only available from the remote control device. 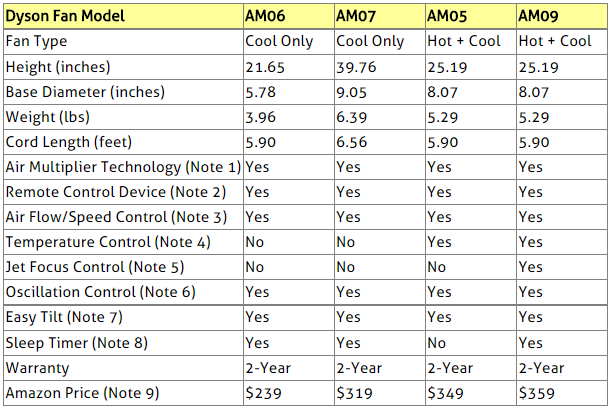 If you need a year round fan for both cooling and heating, you might want to consider either AM05 or AM09. One important difference between these two fans is that with AM05, all functions can be invoked from the remote control and the fan itself, whereas with AM09 only the power on/off is available on the fan, the rest of the functions being accessible from the remote control device only. Another difference is that AM09 comes with the sleep timer and Jet Focus Control features not offered on AM05. Please click the Amazon link image below for the Dyson fan of your choice to see exact price information or to purchase. Note that if some of the prices are not shown on the Amazon link images below, they will be shown once you click the images. Would you rather be interested in a Dyson fan that also purifies the air? It supports the Dyson Jet Focus Control technology (described in Note 5 above) for focused or diffused airflow.